G20 Meltdown Protest - A Demonstration or a Diversion? We are not just witnessing a financial meltdown. 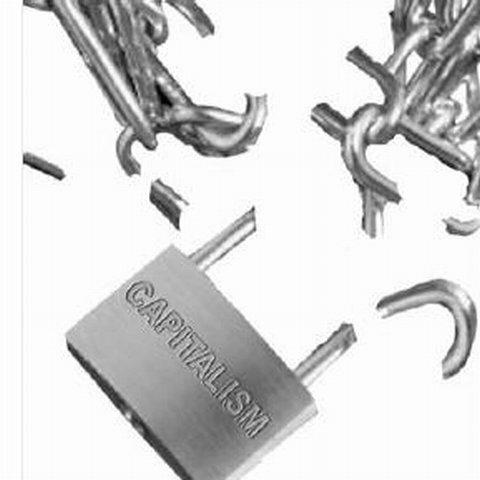 We are in the grip of a crisis of the capitalist system. It has actually been going on since 1971. Today we are experiencing the bursting of the speculative bubble based on fictitious capital. And those ruined will be the creators of real wealth - the world’s wageworkers. The irrationality of capitalism is being laid bare. To give just one example, 4 million homes are empty in the US but hundreds of thousands live in “tent cities”, or in trailer parks. It is no surprise that many want to express their anger. It is even less of a surprise that they want to make a meeting of 25 of the world’s most powerful leaders at the G20 in London the focus of that anger. Yet, by contrast with the crisis they are powerless to solve, these protests are likely to be a welcome diversion for Brown, Obama, Merkel and Co. Rather than something to fear they will draw attention away from the differences between the big powers and their failure to cooperate to prevent the crisis getting worse. At the most the protests will be an index of the level of “social unrest” just about every politician in the world is preparing to face as the economic situation gets more severe. But while parties are ousted or governments replaced - from Lithuania, Hungary and the Czech Republic to Madagascar - as a direct consequence of the economic crisis, no alternative is so far being posed to capitalism itself. In the heartlands of capital the state is not only firmly intact it is still being touted as a saviour of last resort. In fact the organisers this week are making out that the capitalist state can come up with a solution to the crisis. For them the occasion is about putting pressure on the G20 (or simply Gordon Brown) to come up with something that alleviates the situation. First up (on 28 March) are the unions alongside various charities and anti-poverty campaigners marching to demand that the G20 ‘Put People First’, a particularly mealy-mouthed reformist slogan that betrays a complete lack of grasp of the enormity of the crisis and will no doubt pass off with most workers finding out about it for the first time when they glimpse it on telly. The organisers of the 1st April protests are not intending to be mealy-mouthed. On what they have called “Financial Fools Day” the revamped “no global”, “reclaim the streets”, self-styled anarchos are joining environmental campaigners, presumably to protest against capitalism itself. Except that, as always, they have only a hazy narrow view of what capitalism is. If the G20 Meltdown website is not in so many words aiming to get rid of cigar smoking, top-hatted money barons its rant against the capitalist’s “tax-dodging, bonus guzzling, pension pinching, unregulated free market world” that is in “meltdown”, is much the same idea. Behind all the radical posturing we suspect is a desire for a “regulated” capitalism to reform itself into something more humanitarian. How else to interpret an ‘anti-capitalism’ that doesn’t focus on the need to abolish wage labour, whose exploitation is the source of all capitalist wealth? And further fragmenting opposition the Stop the War Coalition’s march against the war in Afghanistan takes place on a different day. As if imperialist war can be treated as separate from the capitalist crisis. This only confirms the fragmented nature of the “social unrest” which as yet poses no threat to capitalism (even if Gordon Brown’s Labour Party is worried about its electoral skin). Even so, the fact is that this crisis of gigantic proportions which has not just come about as a result of greedy financiers and uncontrolled banking systems (though these parasites deserve to lose everything and more) is far from over. No amount of government “quantitative easing” or buying up troubled assets can solve the crisis because the crisis is not about the absence of “liquidity” but about the paralysing slowdown of accumulation as a result of the falling rate of profit. It is no accident that now the parallels are being drawn with the pre-Second World War years of the Great Depression. The future for capitalism really is that bleak. The only way to secure a brighter future is to put an end to capitalism altogether, not just some of its more glaring aspects. This can only be done by the working class: the class whose work is the sole source of real value and the basis of the capitalists’ profits. To start with a serious demonstration would be accompanied by strikes on the day the G20 actually met (not on a Saturday beforehand). The 600,000 just added to the unemployment figures would be a mighty army in conjunction with this. But even this would only be a first step. Abolishing capitalism cannot be done without a clear anti-capitalist programme which aims to abolish money and wage labour along with the capitalists and their profits. A movement based round such an international programme would be a real weapon. This is a far cry from the protests at the G20 but it is the logic of building an effective movement against the epochal crisis that no politician in the world can find a solution to. This is what we are trying to build. Let’s hear from you.